You’ve probably seen large industrial fans in all sorts of warehouses. To be sure, working in a warehouse or large factory is a unique experience. Anyone who’s ever done it for even a few days can certainly attest to that fact. It’s hard work. In our modern economy, such facilities are arguably busier and more critical than ever before. Ensuring that these places are well run, comfortable places to work is important not only for the front-line employees, but for management, as well. The effort to balance out temperature and humidity was, for many years, low on the totem pole of to-do items. But as study after study has indicated, not paying close enough attention to these things can have fairly drastic negative effects. The fact is that given the physical nature of the jobs in factories and warehouses, maintaining comfortable environments is of critical importance. Paying inadequate attention to how hot or cold a work area is can have several negative repercussions. From a financial perspective, providing ideal conditions can cause the electricity bills to skyrocket thanks to the large number of HVAC units needed to heat or cool areas with expansive square footage. Secondly, employee productivity and morale can take serious hits. Research shows that for every degree rise in temperature above 77°F, productivity drops by two percent! 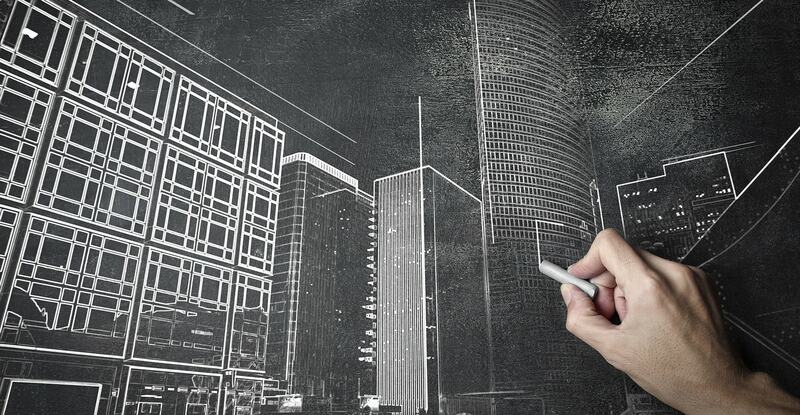 The average drop in productivity caused by buildings with poor ventilation cost $60 billion annually. The fact is, of course, that employee comfort and a company’s finances are interconnected. Think about it. Unhappy employees lead to high turnover – and the cost to replace an employee for a business is estimated at 1/5 of the worker’s salary. Gulp! What’s more, bad air quality caused by ineffectual ventilation can lead to allergy issues, asthma, etc. The impact of all that on insurance and lost productivity can be anywhere from $7 – $23 billion per year! So yeah… quality air matters. 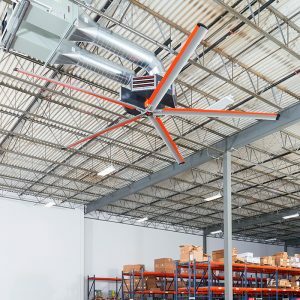 High-Volume, Low-Speed (HVLS) Fans are ever-present in warehouses today. But as the above issues will attest, they’re not always getting the job done. Until now, that is. 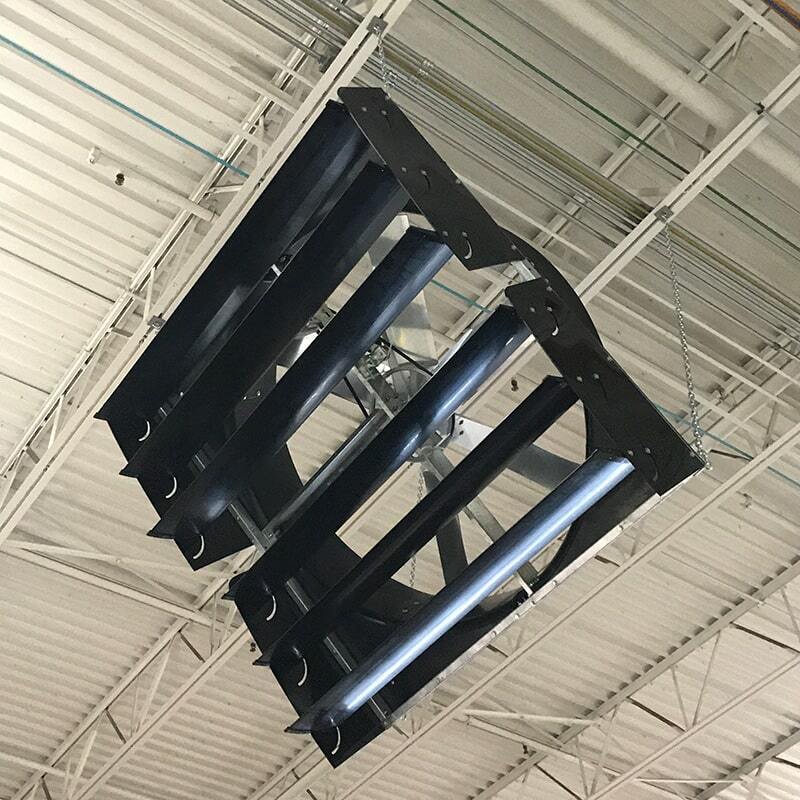 Just as businesses get better by constantly “tweaking” to make things right, Go Fan Yourself (GFY) has done the same for the HVLS market. Making subtle changes to established technology has garnered a whole new generation of HVLS fans that move the needle… by rightly moving the air. It’s a simple change, but wow what a difference. 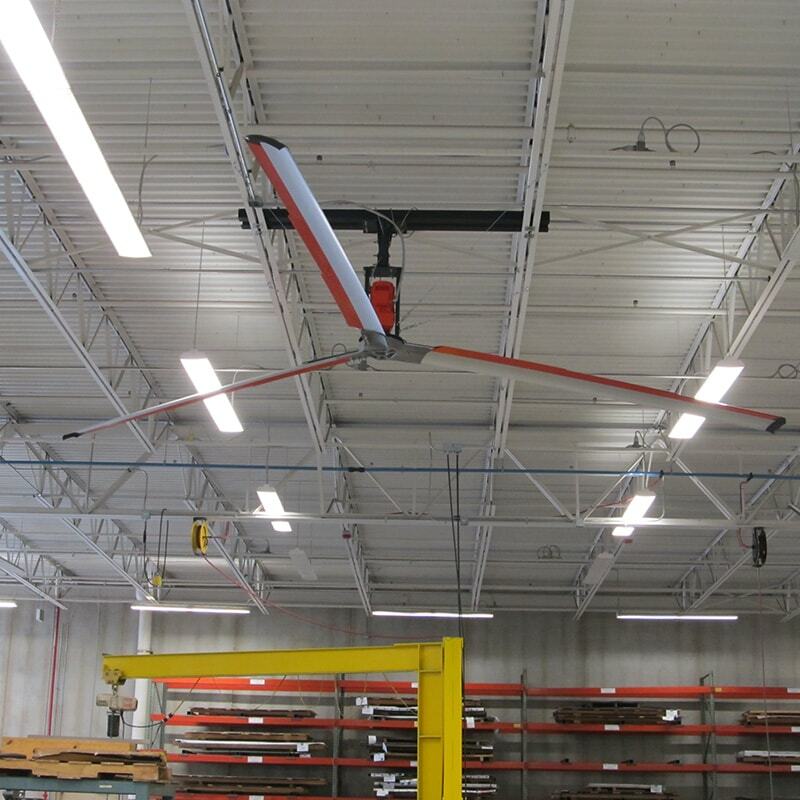 By adding Stepped Blade Technology to our large industrial fans, these units increase coverage areas by 30 percent compared to the standard airfoil blade designs. With options that include size ranges from 8 to 24 feet in diameter, it’s never been easier to find a fan that adequately serves your space. These amazing units blanket an area with a constantly moving air current. Doing so creates an evaporative, cooling effect that reduces condensation and humidity, which in turn prevents the growth of mold and other allergens. And the best part? A 24’ fan (as just one example) uses less power than your average hair dryer. These two models are specifically designed to reverse during colder months to promote heating efficiency and save you big time on HVAC costs. 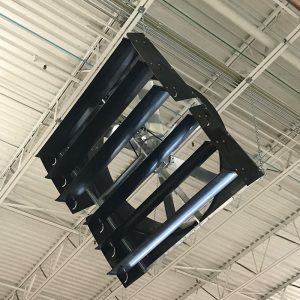 Dual Z-Chill™ diffusers are constructed of cold rolled steel and are insulated and protected with powder-coated paint for attractiveness and durability. What’s more, it gives facility managers the ability to apply AC or forced heat and de-stratify up to 40,000 square feet at a time! 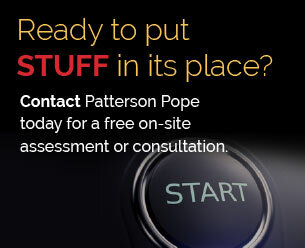 If you’re an HVAC or mechanical contractor, you’ll love the open-platform solution. The units feature bottom perforations and louvers that equally distribute the air across the stepped “Z-tech” blades. In today’s business world especially, flexibility counts. You need to be agile… and that includes being open to innovation. 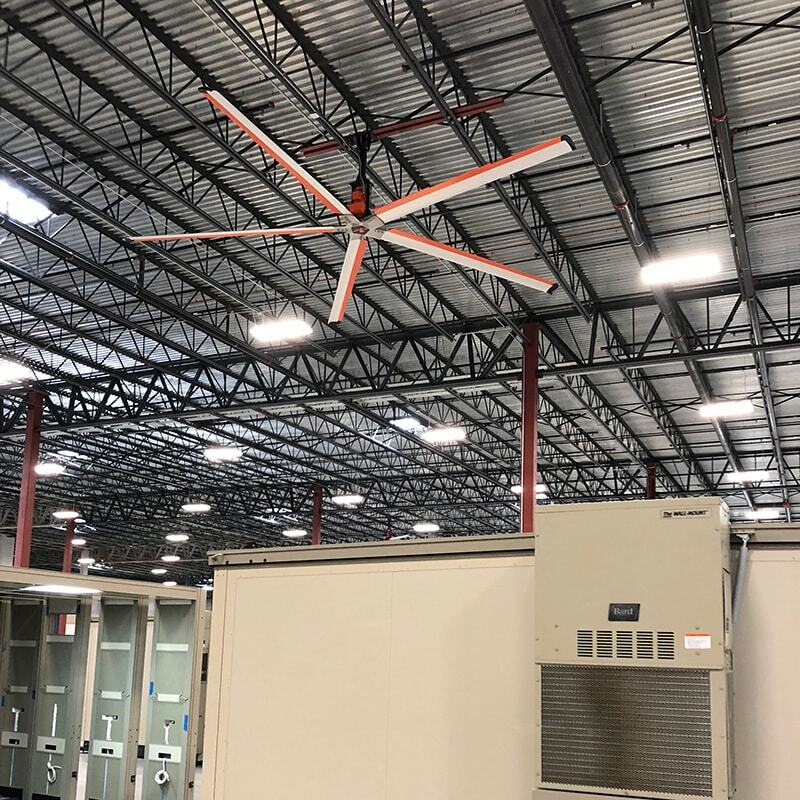 The TAZ fan is ideal for areas with high rack aisles, low ceilings and other areas with obstacles (like high-density shelving) that might impede air flow. The TAZ fan features adjustable louvers for either single or two-directional use. As 2019 begins, there are more than 1.2 million people employed in warehouse jobs across the country. They and the facilities management teams they work with stand everything to gain from doing what’s in their power to ensure a safe, clean, comfortable working environment. New technology – including that provided by Go Fan Yourself – is one of the ways to help stay on the cutting of edge. That kind of commitment has positive ripple effects. Today’s storage facilities, large and small, are important cogs in the machinery of the American economy. 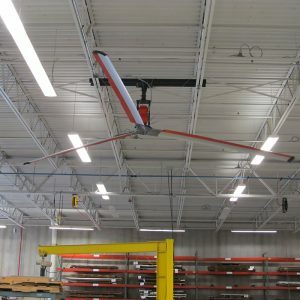 Large industrial fans help ensure that the team members who make those facilities keep humming along are more comfortable and productive. It just makes sense. And if you can save more than a few cents along the way? All the better.